Yesterday, a friend who works at Chevron asked me for advice regarding what to share at an event he has been invited to talk on entrepreneurship and businesses you can start with little or no money. I gave him five solid ideas with examples of real world people earning from those business ideas. One of the ideas was to become a trainer. The good thing about training is that it requires no upfront capital and you can do it as a side hustle. You can make good money offering yourself as an on-request trainer. And it doesn't matter what field you choose. Just a few days ago I shared about my french teacher and even tried to get her more students. I know people who train people on things you will consider trivial and are making a good living off it. Some even do it full-time. You should seriously consider becoming a part-time trainer if you can communicate well and want extra income sources. And trust me, if I can become a successful trainer (which I have) then you can become a successful trainer too. 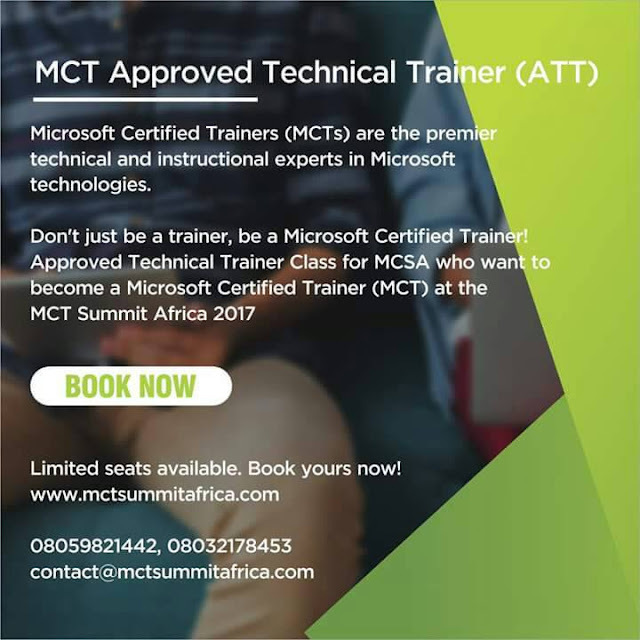 If you want to go the technical route and teach anything Microsoft related, you definitely should come for the Microsoft Certified Trainer (MCT) Summit Africa taking place this December in Lagos. 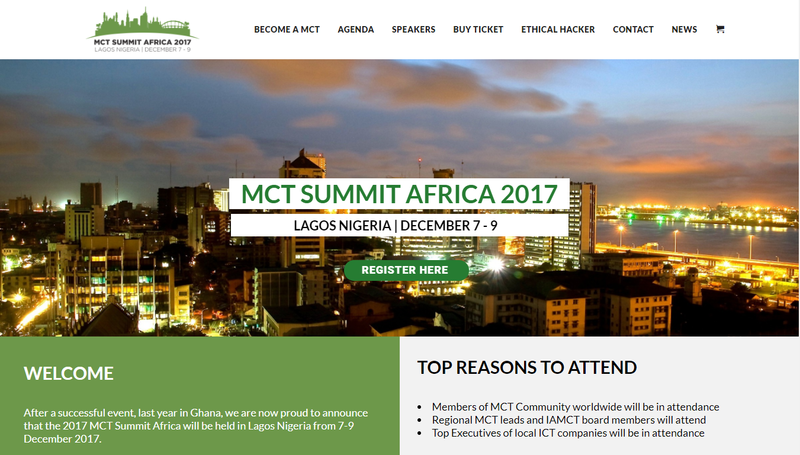 More details and the registration steps at http://mctsummitafrica.com/ And if you have technically inclined friends, do forward them this opportunity. 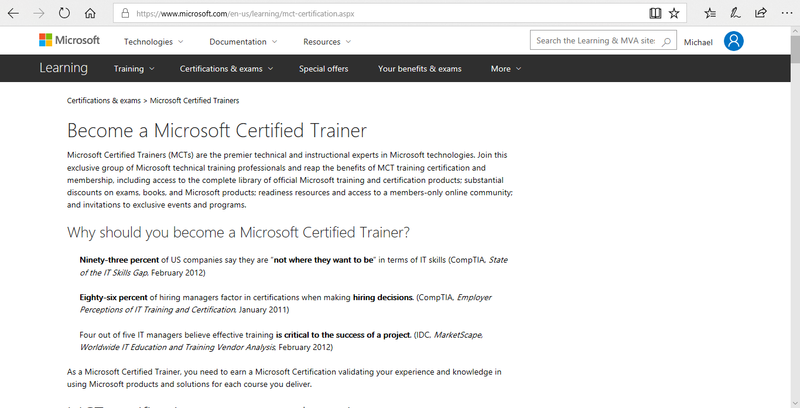 The benefits of becoming an MCT is that doors of training opportunities will fling wide open for you and Microsoft will dazzle you with a hurricane of perks/freebies. You become part of an exclusive community that refers you jobs, and you get access to all Microsoft training resources (materials, official certification exam materials, free and discounted certification exam coupons, and visibility). In just a month of being an MCT, I have gotten about five opportunities. So don't forget to register for the MCT Summit Africa and refer friends. Also there will be special pre-summit heavily discounted certification events. 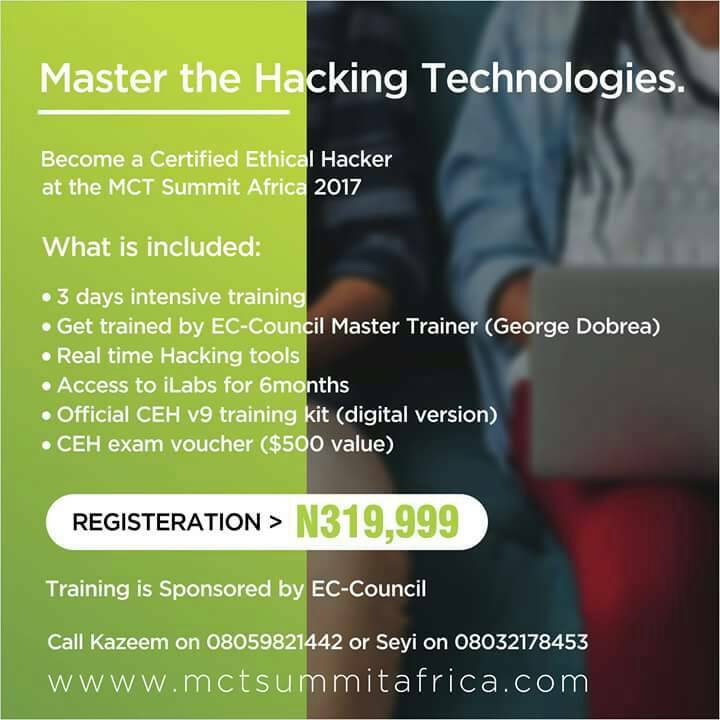 You can reach out to our MCT regional heads, Kazeem Adegboyega on 08059821442 or Seyi Oluwawumiju on 08032178453 to participate in the pre-summit special certification training events. Don't be frightened by the cost of the Certified Ethical Hacker certification training, if you google the actual cost you will see that this one is at a price to kill for and saves you the extra expenses of travelling out of the country for it. The official EC-Council, certifying body, are sending their international trainers. Again, please share with friends who will benefit. Thanks! Great info.Keep up the good work of inspiring and dissenminating career changing information.